Located at the south west corner of the Mesis region, Agios Mattheos is an important village with a population of 1500, built on the lower slopes of the mountain of the same name. It is a village with great personality, fine traditional cafes line the main street and it has a philharmonic orchestra, founded in 1965 A huge, dense forest of oaks, fruit-bearing trees and wild olives encircles the village, and during the 19th century, fugitives from the law would hide out amongst the myrtles and lentisk shrubs. Near the summit stands the Monastery of Pantokrator (the Almighty), built at the beginning of the 4th century AD. Its remarkable all-night festival takes place on August 6th, and is well worth seeing. Nearby is the entrance to a cave, which is said to lead down to the sea. The historical value of the place is undisputed, for here traces of Mesolithic Man have been found. 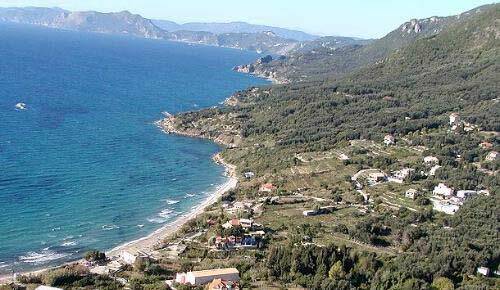 From the village of Agios Mattheos, a road leads down to Paramonas, an excellent sandy beach with some small islets offshore and two or three tavernas beside the waves. To the south are the clean and peaceful little beaches of Prasoudi, Kavouli, and Skidi, worth keeping in mind if you seek solitude during the peak season.